Despite disputes regarding defence spending at the summit in Brussels on 11-12 July, NATO leaders approved a series of important decisions. They mark the next phase of the Alliance’s adaptation to the changed security environment and build on measures initiated at the 2014 Newport summit and broadened at the 2016 Warsaw summit. For Poland, the most significant decisions from the Brussels summit are those pertaining to the improvement in the ability to swiftly deploy larger forces. Allied units currently stationed on the Eastern Flank are first and foremost there to demonstrate NATO’s determination to respond to aggression and would have to be substantially reinforced in a conflict. The Allies approved the NATO Readiness Initiative (“Four 30s”), promoted by the U.S. By 2020, NATO countries are to have 30 major naval combatants, 30 heavy or medium manoeuvre battalions, and 30 kinetic air squadrons, ready for use within 30 days or less, together with enabling forces. Implementation of the initiative will substantially increase NATO’s rapid-response capabilities. In just the land domain, it would provide higher readiness forces, amounting to 7-10 brigades (3,000-5,000 troops each), in addition to the multinational NATO Response Force (NRF), which was reformed after 2014. The NRF land component consists of three brigades (together with other components comprising around 40,000 troops), with one deployable in only 45 days, a second in 30 days, and the third (VJTF or “spearhead”) in 5-7 days. Multinational forces stationed on rotation in Poland and the Baltic States amount to a single brigade (four battalion-sized NATO battlegroups, with around 4,500 troops in total) while a separate U.S. armoured brigade (around 3,000-4,000 troops) conducts exercises across Central and Eastern Europe. Increasing and maintaining the readiness of forces might pose a significant challenge to many NATO members because it involves high costs. Years-long cuts in defence spending resulted in considerable deficiencies in such areas as training and the availability of equipment. Together with the large operational involvement of some Alliance members, this repeatedly led to problems in manning the NRF. At the same time, even full implementation of the “Four 30s” should be complemented with further investments in a broader spectrum of forces so NATO can conduct collective-defence operations in several regions and react to crises beyond its territory. Given Russia’s regional superiority over the Alliance on the Eastern Flank, the response time of units under the initiative should also be eventually reduced well below the current 30-day target. After almost three decades of reductions, the NATO Command Structure (NCS) will be enlarged for the first time. Two new commands will be created. A Joint Force Command (JFC) in Norfolk in the U.S. will be responsible for securing the Atlantic for the potential deployment of troops to Europe. A Joint Support and Enabling Command (JSEC) in Ulm, Germany, will support the movement of forces within Europe. NATO also wants to tackle related physical barriers (deficiencies in infrastructure and its incompatibility with military requirements as well as shortages in means of transport) and procedural obstacles (the time it takes for national permission for a border crossing by forces and equipment of other states is to be shortened to five days by the end of 2019). These actions will be an area of cooperation with the EU, which possesses many more competences in the civilian domain and a budget for investment in transport infrastructure. NATO also announced the establishment of two Land Component Commands (LCC), capable of commanding a multi-corps operation, at a later stage. Poland seeks to host one of these commands. The lack of a final decision on that matter at the summit is likely related to budgetary constraints and staff shortages, which might lead to increased competition for new structures. Although the NCS staffing is to grow from around 6,800 to 8,000 posts, this increase appears to be minimal compared to previous cuts. For comparison, in 2011, the NCS included more than 13,000 personnel. Resources are also needed to implement changes in tactical-level commands outside the NCS, including the establishment of the headquarters of the Multinational Division North by Denmark, Estonia, and Latvia, in addition to already functioning headquarters of the Multinational Division North East in Elbląg, Poland. NATO has yet to develop a comprehensive response to Russian anti-access/area denial (A2/AD) systems, which might hinder the movement of Allied units. Implementation of the “Four 30s” initiative will contribute to this effort, especially by increasing the readiness of air and maritime forces capable of stand-off strikes. NATO also is enhancing its Integrated Air and Missile Defence system, partly through exercises, but the Allies lack the will to station such defences on the Eastern Flank. Poland’s purchase of a Patriot medium-range system will narrow this regional gap, but only in the longer term, as the first batteries are to be delivered in 2022. Moreover, the Baltic States cannot afford such advanced systems. NATO’s freedom of action might also be constrained by the risk of nuclear escalation. This is related to both Russia’s aggressive nuclear rhetoric and the knowledge that in a conflict, NATO would have to neutralise A2/AD systems stationed on Russian territory. As part of efforts to adapt its nuclear deterrence, the Alliance is to ensure coherence with conventional deterrence. This will most likely include—in line with U.S. calls—closer integration in terms of planning and exercises, but it is unclear the extent, in part given the sensitive character of nuclear issues for many European societies and governments. NATO also declared its determination to use the “full range of capabilities” to deter and defend against cyberattacks. This means the Alliance will no longer rely solely on securing its networks but also will be able to retaliate against an adversary’s systems with cyber capabilities provided by its members. The new Cyberspace Operations Centre in Belgium will be tasked with the coordination of the Alliance’s cyberdefence. The depth and pace of further adaptation of deterrence and defence policy will largely depend on maintaining NATO cohesion. Members most concerned about Russia (Poland, the Baltic States, Romania) would like the Alliance to provide a credible defence of the Eastern Flank. Therefore, they will not only strive for full implementation of the current initiatives but also call for other considerable steps. In turn, from the perspective of many other Allied countries (e.g., France, Germany, and those of Southern Europe), these would be unnecessary, costly, or even provocative. In their view, the prospect of an even less clear NATO military response is enough to deter Russian aggression. They also seek to focus the Alliance’s attention on dialogue with Russia and the situation on the Southern Flank. The lead role in building consensus within NATO has been played so far by the U.S., which has driven adaptation to threats from both Russia and terrorism. Strengthening the Eastern Flank remains the aim of the U.S. State and Defence departments, backed by strong support in Congress, as evidenced by the increase in funding for the European Deterrence Initiative from $3.4 billion in 2017 to $6.3 billion in 2019. There is a risk, however, that the administration’s room for action will be limited by President Donald Trump if he intensifies attempts to normalise relations with Russia or further boosts pressure on the Allies to increase their defence spending. An escalation of tension around the latter issue might also weaken the willingness of Europeans themselves to cooperate with the U.S. 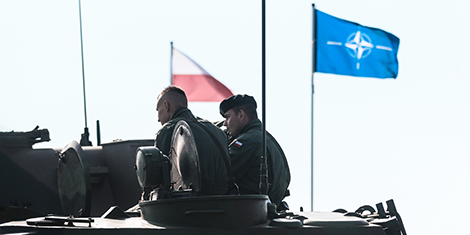 The gradual character of NATO’s adaptation and the uncertainty regarding its further scope highlights the significance of the modernisation of the Polish armed forces. It is especially important to improve Poland’s abilities to defend its territory and counter A2/AD systems to provide both the time and support necessary to deploy NATO reinforcements. The perspective of enlargement of such Allied forces also increases the need for Poland to invest in the necessary host-nation infrastructure. At the same time, Poland’s readiness for greater involvement in activities on the Southern Flank could contribute to maintaining Alliance cohesion. Artur Kacpryzk is an analyst at PISM at the European Security and Defence Economics Project.